In a medium mixing bowl with a hand held mixer on medium speed, cream 1/2 cup butter with 1 cup granulated sugar. Beat in egg yolks and continue to beat until light and fluffy. With mixer at low speed, blend in flour mixture, alternating with milk and vanilla. Turn batter into prepared pan; spread evenly. Bake caramel bars layer for 30 minutes. In a small bowl, beat the egg whites until stiff peaks begin to form. Gradually beat in brown sugar; stir in nuts. Spread over the top of the warm crust. Return to oven and bake 20 minutes longer, or until puffed and lightly browned. Cool caramel bars in pan on wire rack. 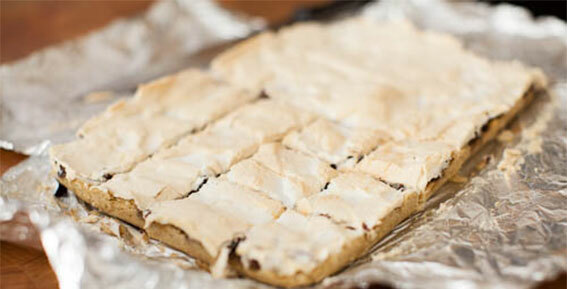 For an extra treat, add chocolate chips to the caramel bar mixture before baking.